Ever wish your PC had a "super folder," one that would automatically sync whatever you dragged into it with your phone, your other PCs, and the Web? That's Dropbox in a nutshell. It's one of the Web's most popular services, and with good reason: it makes file and folder sharing ridiculously easy. A free Dropbox account nets you 2GB of storage space, which is great--but who wouldn't like just a little more? Over at Lifehacker, there's a great tip on how to get a little more. 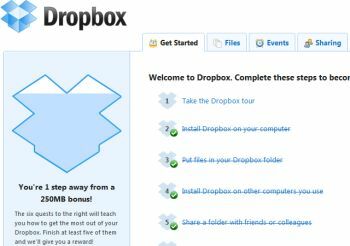 Just sign into your Dropbox account on the Web, then click the Getting Started tab. Complete five of the six listed steps (some or all of which you may already have done) to earn an extra 250MB of storage. Want to learn a little more about the service? Find out how to share a Dropbox link with just two clicks, how to get Dropbox for Android and iPad (it's already available for iPhone), and three ways Dropbox can improve your productivity.